Connecticut is a small state but densely populated state in the New England region of the United States, located in the northeastern part of the country. Although densely populated over all, most of the population is located in industrial cities along the state's coastal highways. Thus, the state also contains rural areas and small towns, particularly in the northwestern and northeastern corners. Per capita income in Connecticut is the highest for any state in the country. This is in large part due to higher earners fleeing from the high taxes of nearby New York (Connecticut did not have any state income tax until 1991). 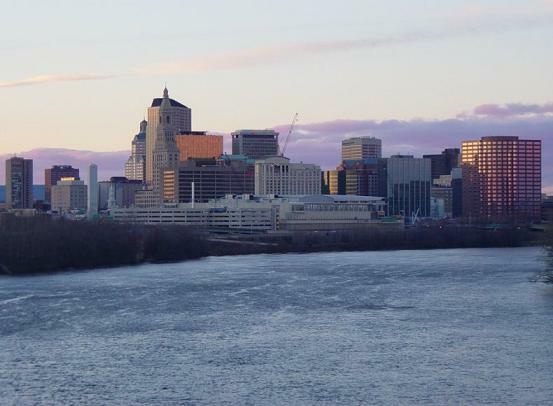 However, despite its reputation as a rich state, there are also some poor areas, for example, Hartford is one of the ten cities with the lowest per capita income in the country. Leading education institutions in Connecticut include Dartmouth College (in Hanover), the University of Connecticut (in Storrs) and Yale University (in New Haven). Professional sports franchises in Connecticut include the Bridgeport Sound Tigers (ice hockey in the AHL) in Bridgeport, the Connecticut Defenders (Eastern League baseball) in Norwich, the Hartford Wolf Park (ice hockey in the AHL) in Hartford, the New Britain Rock Cats (Eastern League baseball) in New Britain, and the New Haven County Cutters (Can-Am League baseball) in West Haven. Some of the leading companies with their headquarters in Connecticut are Aetna (in Hartford), Colt's Manufacturing Company (in Hartford), General Electric (in Fairfield), International Paper (in Stamford), Subway (in Milford), the Hartford Financial Services Group (in Hartford), United Technologies (in Hartford) and Xerox (in Stamford). Places to visit in Connecticut. Guide books with travel information about Connecticut. Details of skiing in Connecticut. Towns and cities in Connecticut.